Blog Tour for Comes the Night! Have your cake and the candles too! Spiders, spiders … yeah! Everywhere. I’ve ordered a witch’s ladder, or if you prefer, pagan prayer beads. I bought these from wonderful Etsy seller, SilverBirchHill. Check her out. She has some amazing stuff on her site. Here’s a bit of the info on my beautiful beads. Witch’s Ladders or Druid’s Ladders are Pagan Prayer beads, traditionally made with 40 beads. Like the prayer beads of other faiths they are used for meditation, counting prayers/spells and to help focus the mind. The 40 beads have been split into sections of 3, 7, 9 and 21 beads as these are traditionally magical numbers honored through the beads. Hematite is particularly effective at grounding and protecting. It harmonizes mind, body and spirit. Used during out-of-body journeying, it protects the soul and grounds it back into the body. This stone has a strong Yang element and balances the meridians, redressing Yin imbalances. It dissolves negativity and prevents negative energies from entering the aura, restoring peace and harmony to the body. Lovely, huh? I cannot wait to hold this. Hematite is a favorite stone of mine. I have a walnut-sized round of hematite that I often tuck in my pocket when I need that extra boost. But the hemitite is not the only reason I couldn’t resist this ladder. I love of spiders too. They’re one of my favorite personal symbols (I have very few). No, not the tarantula-crawling-down-my-shoulder thing or the venomous things that TRACK YOU DOWN! But I won’t purposely kill a spider – ever. Let them go, let them go, I say! Spiders are diligence and persistence. And who doesn’t love the webs! What an intricate symbol – and intricate world! – of life, death, struggles and conquests. As a writer, tenacity has to be in the blood. What animal is more tenacious than a web-spinning spider? Superstition on spiders? Oh you bet …. Seems I am not alone on the never kill a spider thing. Rain will surely follow. I remember back in the first grade discussing this bit of wisdom in the sandbox. Someone had (so they said) killed a spider a day or two earlier, and we were wondering, well, where the heck was the rain? Yeah, he lied. That was my guess. If a spider drops on the table during a meal, you have an unknown enemy. But if a spider drops onto the threshold, someone in the household will die. You’ll meet a new friend if you run into a web. Ah, nothing like a face full of spider webs when you’re walking through a dark passage, huh? Okay, even with my appreciation of spiders and their work, I do NOT like a face full of webs. Oh, yeah, you can brush the webs away. But where are the spiders that were on it? They’ve got to be crawling somewhere. Everywhere …like your neck right now. See one crawling on the wall, your deepest wish will come true. See a big spider? Great! The bigger the better for luck. It’s also good luck to find a spider on a wedding dress. When many spiders are spinning their webs, we’re in for a dry spell. If the spiders are hiding, bad weather is on the way. 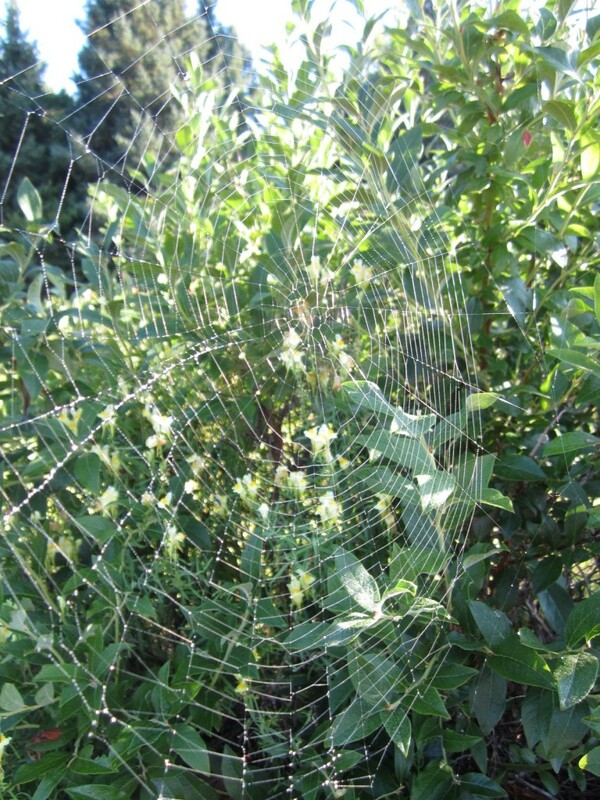 When there are dew-covered webs on the lawn in the morning, it’s going to be a beautiful day. If there are lots of webs in the spring, it’ll be a good autumn. How about you? 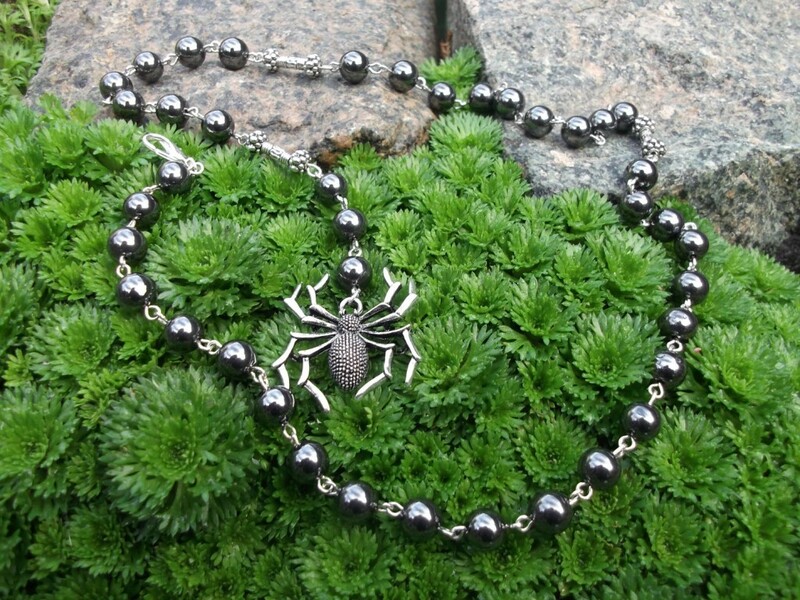 Have you heard any superstitions or folklore about spiders you’d like to share?